It’s finally here – the long awaited Papal Encyclical Letter, LAUADTO SI’, by Pope Francis, on the Care for Our Common Home has been published! This entry was posted in Uncategorized and tagged Encyclical, Green, Laudato Si, Pope Francis on June 18, 2015 by stdavidandstpatrick. Why Francis and Benedict have one Green mind. 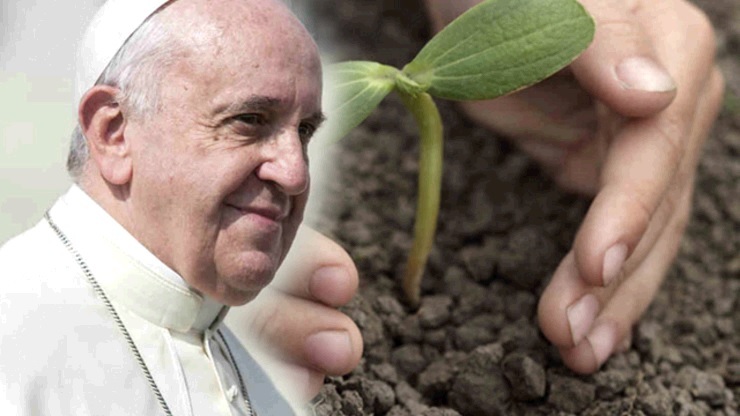 Later this week the Church expects to receive Pope Francis’ latest encyclical letter celled “Laudato Si – on the environment.” Here’s a interesting article that shows Pope Francis’ thinking is really nothing radical, but an extension of what Pope Benedict started. Mythology and media narratives to the contrary, Pope Francis has far more in common with Pope Benedict XVI than whatever separates them. Francis probably could be better understood as “Benedict 2.0,” supplying a warmer and more populist package for the same basic positions espoused by his more cerebral predecessor. The release on Thursday of Pope Francis’ highly anticipated encyclical letter on the environment, Laudato Si, may well be the latest proof of the point. First of all, it’s hardly as if embracing the cause of fighting climate change, saving the rainforests, and otherwise protecting the environment is somehow a break with Benedict. On the contrary, Benedict was famously the pope who installed solar panels atop a Vatican audience hall and signed an agreement to make the Vatican Europe’s first carbon-neutral state in order to back up his strong ecological concerns. Yet Benedict also tried to paint a distinctly Catholic shade of green in the way he approached environmental questions, and Francis recently provided a hint he’s thinking the same way. Relativism is a philosophical position that holds there are no absolute moral rules, because everything is relative to particular circumstances and individuals. At the popular level, it refers to an “anything goes” morality opposed to traditional Catholic teaching. It might seem odd for Francis to use an environmental tract to bring up a debate over moral philosophy, but that’s where understanding the mind of Benedict XVI helps. For Benedict, secular environmentalism is the most promising route for recovery of a strong sense of “natural law,” meaning the idea that right and wrong, truth and falsehood, are real qualities which exist in nature, and which human beings can discover using their reason and conscience. Many Catholic thinkers, prominently including Benedict XVI, worry that natural law has been supplanted in the popular mind either by relativism or by positivism, the idea that moral rules are imposed by human authority and thus more akin to the speed limit than to gravity – something invented, instead of being given in nature. Benedict believes that environmentalism is leading people back to the idea of natural law, because it proves that limits on what human beings can do without paying a price aren’t just arbitrary but absolutely, objectively real. “Everyone can see today that … we can’t simply do whatever we want with this earth that has been entrusted to us, we have to respect the inner laws of creation, of this earth, if we want to survive,” Benedict said in 2007. From there, Benedict said, we may learn to listen to human nature as well, discovering moral laws that stand above our own ego. Benedict called all this a “secular path” to the formation of conscience. His comments on relativism last Saturday indicate Francis is likely to make a similar point, treating environmentalism not just as an important social cause, but also a moral teaching moment. Through the history of salvation, Francis said, God has led the Church progressively from “ambiguities” to “certainties.” Close your eyes, and you easily could have believed you were hearing Benedict XVI. In most of the ways that matter, what’s changed from Benedict to Francis isn’t the lyrics, but the music. Instead of Wagner, people today seem to hear a saucy Latin rhythm when the pope speaks, often making the message easier to take. The real difference between the two pontiffs may lie in reach and effectiveness, not content. Francis has succeeded in convincing a wide swath of people, especially those outside the Church, that he values their experiences and cares about their perspectives. That impression makes them more inclined to view his take on things with sympathy rather than skepticism. Warmth, in other words, isn’t just about packaging and tone. It also translates into power, meaning the ability to shape opinion and to win hearts and minds where others have failed. Laudato Si seems destined to be the latest chapter in this bond between Benedict and Francis, with the key question being whether Francis’ more enchanting presentation once again allows his “2.0” version of the message to pack a greater punch. This entry was posted in Uncategorized and tagged Encyclical, Green, Laudato Si, Pope Benedict, Pope Francis on June 15, 2015 by stdavidandstpatrick.